Everett, WA is a thriving, bustling city and serves as the economic hub for communities to the north of Seattle. It is home to Boeing's sprawling airplane production facility at Paine Field, in addition to the homeport for the Navy's USS Nimitz. Situated along the eastern shores of Puget Sound, Everett boasts the largest public marina on the west coast. It offers numerous commercial, recreational and civic opportunities. 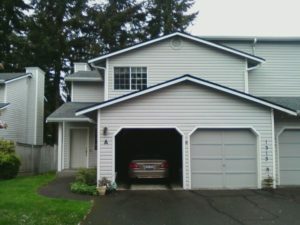 Everett has become an investment magnet by investors driven away by the high prices in Seattle. With a growing rental market, Everett is in good position to reap benefits for investors for a very long time. But all that buying demand does come at a price, albeit a smaller one. Our northern office is located in the heart of Everett. From here we manage rentals in Edmonds, Lynnwood, Mountlake Terrace, and more. So whether you are looking for a property manager for your rental, or you are a tenant looking to rent a property, we can help. We know the neighborhoods, market rents, and the best fit for each owner and tenant. Everett is an older city. As such, rental properties come in all shapes and sizes. These include newer and older waterfront or view homes, condos, townhomes (such as the one on the right), multi-plexes, and large and small apartment communities. Therefore, if you need a good property manager, Full Service Property Management can take care of your needs. In addition, we can take care of your property maintenance needs as well. Our staff of trained property maintenance personnel are efficient and do quality work. Service requests, work orders, and turnovers are our specialty. Working efficiently in the inner city takes skill sets that we have honed. That saves you money yet gets the job done well. Ready to get started? Contact us: (206) 900-9006 or complete the form below.